This is the place where the world discusses indoor air quality, the built environment and disaster restoration issues. Every Friday at noon ET the show is live. The shows host are Joe Hughes, President of IAQ Training Institute and Cliff Zlotnik, President of IDEAZ, LLC. Every week we interview experts from the indoor air quality, building sciences and disaster restoration industry. 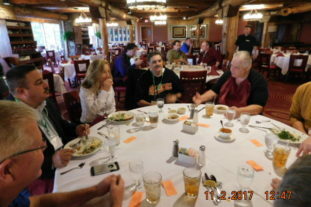 As instructors for IAQ and disaster restoration training programs and active participants in industry associations we have the credibility and contacts necessary to bring top industry experts as guests on the show every week. The show is designed to help promote education and communication for industry professionals and consumers in need of assistance with IAQ, built environment and disaster restoration issues. In order to call into our radio show, just pick up any ordinary touchtone phone and dial 1-724-444-7444. This will connect you to Talkshoe’s system. At this point, you will be prompted for a talkcast/show ID number. Our show ID number is 1547. If you want to join us live on the air, just enter 1# when prompted. If you are a guest on the program, please use the PIN number which we have provided you with. Once you hear, “You are now joining the talkcast”, you will be able to hear us and we will be able to hear you. We will have you muted during segments of the show so that background noise from your location will not interfere, but once you’ve been introduced, we will un-mute you. For optimal sound quality, we recommend that you use a landline (i.e. not a cellular phone) with either a handset or a headset (i.e., no speakerphone). IAQ is an acronym meaning Indoor Air Quality. This field encompasses studies of airborne allergens, chemicals, particulate matter, pathogens and psychrometrics in enclosed spaces such as office buildings, residences, automobiles, aircraft to name a few. IAQ is becoming more and more relevant as our society builds more buildings and homes with increasingly airtight designs and there is less air being exchanged with the outside. IAQ Radio is a brand-new medium for our industry. Live, weekly, interactive podcasts enable us to reach a much broader audience than is possible with traditional sources of print and Internet media. This new medium allows us to reach out and take on the worlds IAQ challenges. Is IAQ Radio all about Indoor Air Quality? While our talks deal a lot with indoor air quality, indoor air quality is a small part of the subject matter that we cover in our weekly episodes. IAQ Radio is hosted by Joe “Radio Joe” Hughes and Cliff “Z-Man” Zlotnik. John Faith is at the controls for sound mixing. The Restoration Industry Global Watchdog Pete Consigli joins us for restoration industry related shows. What is IAQ Radio’s schedule? We broadcast live every Friday at 12:00 p.m. Noon EST/EDT. Occasionally, we may record our show earlier in the week in a non-interactive mode if a member of our team is unavailable on Friday. A podcast is a new form of Internet media which is a fusion of some of the most prolific Internet technologies. Originally called a podcast because it favors iTunes/iPod users, podcasts are now truly platform agnostic. Podcasts use traditional MP3 compression techniques to produce a relatively high quality audio file while having a relatively small footprint. Combined with this MP3 technology is an XML technology called RSS, which means Really Simple Syndication. All of this means that your Internet-enabled computer will be able to automatically download the latest episodes of IAQ Radio with no user intervention if so desired. How do I call into the show? Click the green button that says live now. Sign up for a PIN number at talkshoe.com. This is a free service. Using any ordinary touchtone phone, dial 1-724-444-7444. When prompted for a talkcast ID number, enter 1547#. When prompted for your PIN, enter your PIN, followed by the # (pound) key. You will be placed on mute and we will bring you on! To do this, follow the steps above and type into the chate box. The hosts will and other guests will see your question or comment. Can you text-chat and call in simultaneously? Absolutely! If you have the ability to be on a telephone call and be on the Internet at the same time, the Talkshoe technology will allow you to do that. We highly suggest that you utilize this method of connectivity as it will allow us to communicate with you and let you know when we would be able to put you on to ask your question. How do I become a guest on IAQ Radio? If you are truly passionate about being a guest on IAQ Radio, please contact us using the feedback system. If you are within a 100 mile radius of Studio B, we highly encourage you to come to the studio for a live interview. If this is not possible, you can telephone in and be interviewed that way. How can I become a sponsor for IAQ radio? Please utilize our contact information which is found in our Feedback section to let us know that you would like to be on the show. Why is the audio quality better in iTunes than it is when I am listening live? Due to the nature of how we bring you our show live every week, our live audio is not as clear as it should be. In the studio however, we make a fully digital recording of everything. This is compressed to MP3 and is uploaded as soon as the show ends. It may take a few hours for this audio to become available for download and distribution via iTunes.